It’s not usually the first thing you notice, but your roof says a lot about you and your home. We have included a few of the most common types of residential roofs and roofing materials – both natural and synthetic – to fit your budget and style. Composition shingles are the most commonly seen roofing material on homes today. The material features a fiberglass or cellulose reinforcing mat at the center of each shingle, which is coated with mineral granules and asphalt that makes the shingles waterproof. This roofing material is easiest on the wallet and for do-it-yourself installations. Easy on the wallet – They’re one of the most affordable of all roofing materials and since they’re easily replaceable, this type of roofing style can cut down your repair costs. They’re durable – Composition roofs can usually last more than 30 years, depending on the weight of the shingle. Composition shingles are very fire resistant, as well. Variety of styles – Composition shingles can come in various colors, textures and styles, making it easy to select shingles that will complement the style of your home. Wood shingles are small, light and severed on both sides. Wood shakes are generally thicker and are hand-split. The most common wood shingles are cedar, which are longer-lasting and more fire resistant. Fire-retardant coatings are typical with wood shingles. Take into consideration that wood shingles require a steeper roof pitch to get rid of moisture. Beautiful – The character of wood shingles blends nicely with the landscape and other surroundings. Its natural color and look enhance your home’s overall curb appeal and over time, the cedar will change to a more old-fashioned, silver color. Light – Second to asphalt shingles, wood (cedar) shingles are one of the most lightweight roofing materials, making it easier to repair. Insulated – Cedar wood is a natural thermal insulator, keeping your house cool during the summer and lowering the heating bill in the winter. Metal roofs are usually made up of steel, aluminum and copper. Metal roofing can be more expensive than other roofing material options, due to the fact that metal shingles aren’t vulnerable to the wear and tear that other shingles are, like rust, warping or decay. Metal roofing is a great option for residential and commercial buildings in Colorado as it is very fire-resistant and easily sheds snow with no ice damming. It can get noisy, however, when the rain or hail starts to fall. Environmentally Friendly – Metal roofing is easily made from recycled metals and can generally be laid directly on top of old roofing materials, like composition shingles. Clay tiles are all-natural and are fired in a kiln. They are generally one of the most expensive and heaviest of roofing materials. Clay tiles will last a long time, however, as they are environmentally friendly and are resistant to both freezing and hot temperatures, as well as the sun’s harmful UV rays. However, they’re not optimal in Colorado due to being vulnerable to cracking in extremely low temperatures. Slate tiles are natural, shingle-like flat sheets of rock. Slate tiles can also be very pricey and heavy for your roof, but the stone look provides plenty of curb appeal to your home. Because of its weight, slate tiles do require extra roof support and framing. This roofing material requires professional installation, as walking on these tiles can be difficult and result in breaking the stone slates. Low-maintenance – Rock is resistant to fire, moisture and insects, protecting your home from the outside elements with little-to-no maintenance. A gable roof is very common among residential properties. A gable refers to the triangular portion of the wall between the edges of intersecting roof pitches. It looks like an upside-down V. This type of style is what you generally see in neighborhoods. It’s one of the simpler styles, however gable roofs are not ideal for high wind areas like Fort Collins, Greeley or along the Front Range, because they easily can catch wind much like a sail or a plane’s wing would. A hip roof style has four sloping sides with no vertical roof lines or walls. Hip roofs are both square and rectangular. They have a more complicated truss and rafter structure, but are very common among residential properties as well. An A-frame roof has sides with very steep angles (roofline) that usually begin at or near the foundation line, and meet at the top in the shape of the letter ‘A.’ This roof style is mostly seen with churches, German-style cottages and other structures of the like. This style of roof is mostly associated with barns and residential homes with lots of attic space, so much that there’s room to turn them into bedrooms or extra spaces. Yes, flat roofs are once again making their way into residential neighborhoods. Flat roofs have been rebuilding their reputation as solid, residential roofing options since they are affordable, durable, easily-accessible and maintainable. Better quality practices and materials support the idea of once again having a flat roof over your family’s head, giving you a less expensive, easier-to-build option in choosing a roof for your residential property. Thinking of having a rooftop deck or patio? 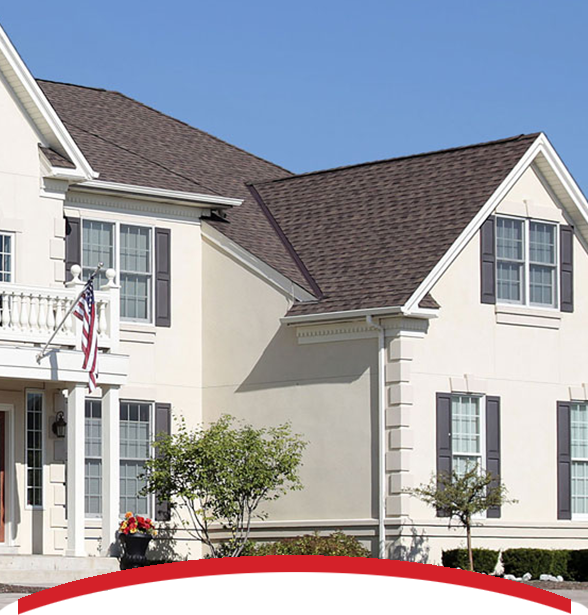 There are many other styles of residential roofing, which we’d be glad to go over with you in person, to make the best possible decision for you, your family and your home. Knowing the pitch or angle of your roof is helpful when you’re thinking of additions or remodels, roof repairs or roof replacements. Your home’s roof pitch is calculated by the number of inches the roof rises vertically for every 12 inches that the roof extends horizontally. If your roof rises 8 inches for every 12 inches of horizontal run, your roof has a 8-in-12 pitch.